Some runners swear by minimalist, or "barefoot," running shoes, saying they are more comfortable or enable faster runs. But can going without the padding and support offered by traditional running shoes do more harm than good? 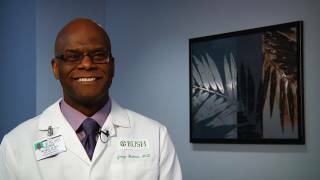 George Holmes, Jr., MD, a foot and ankle surgeon at Rush University Medical Center, weighs in on the phenomenon — and its impact on runners' feet. Q: Is barefoot running just a trend, or is it here to stay? Is there evidence that it’s good or bad for you? Holmes: I don’t think it's something that will hold up over the long run. There's not hard proof that it's good or bad for you. But looking at the science of it, I think that if I were to measure the amount of pressure you put on your foot running in barefoot shoes versus running in cushioned shoes, you're going to see more pressure transmitted to your foot with the barefoot shoes. Anecdotally, my colleagues and I are seeing more patients come in saying "I've been running for years. I switched to these barefoot shoes and now, after two months of running, I've got a stress fracture." Q: Do you think people should avoid barefoot running, then? Holmes: Everyone is different. I was watching a marathon race once where the analysts were doing slow-motion analysis of the elite runners in the front, and then of everyone else. There was a stark difference. The elite runners spent most of their time in the air; their feet spent very little time on the ground. After the heel strike they were quickly back on the forefoot, or front half of the foot. But everyone else, the plodders like you and me, spent a lot more time with their heels on the ground. It was a good illustration of why someone who's running like the average person is probably going to need more of a cushion — because they're pounding — whereas someone running like the ultra-elite person might not. Q: So how can someone tell what kind of runner they are? Holmes: In most cases, a trained observer such as an orthopedic surgeon, a physical therapist, an occupational therapist or a physiatrist can look at your shoes, look at your body alignment and tell you if you're overpronating, heel striking or if you're a toe runner, someone who spends less time on the heel. They can give you advice about how to choose the proper footwear and, if necessary, alter your gait to prevent or reduce injuries. For example, if your heel strikes with a lot of force, you might want a shoe with extra cushioning in the heel. If you overpronate, which means your ankle rolls in too much with each step, one might recommend a cross-training shoe, which will be stiffer and offer more structured support than your average jogging shoe. In complicated cases, if you are a person who does marathons or triathlons and you're having a recurrent problem like iliotibial band syndrome or shin splints, you might benefit from orthotics or gait analysis. Q: What about the surface under your shoes? In winter or bad weather, is it better to run on treadmills or indoor tracks than outside? Holmes: It's true that a surface you've been running on in the spring or summer that felt fairly cushiony, maybe a dirt or mud surface, might freeze and become as hard as concrete or asphalt in the winter. But even though a treadmill might be a softer option in the winter, I generally like to advise my patients to run outside or on an indoor track if they can. Every time your foot strikes a treadmill, it's striking exactly in the same position. There's no variation. But if you run outside, there's a little unevenness. You have to turn corners, go up and down hills. Even on a track, you're making turns around the track. Compared with constant pounding in the same position, which can put a lot of stress on your feet, that variability gives you a little more protection from injuries like stress fractures or shin splints. So in general, if the surface is safe and the environment is safe, I would rather have people run on a surface that will provide more variability than a treadmill.